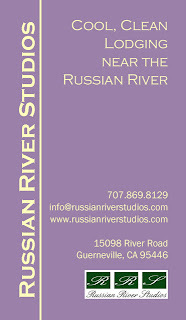 Russian River Studios offers perfect vacation accommodations in the west Sonoma County area. They are conveniently located across the road from the Russian River and surrounded by beautiful redwood-covered mountains. Yet, we are only a short walk along a tree-covered path to downtown Guerneville. Our quaint, uniquely-styled studios are clean, comfortable, and responsibly priced. Their fully-equipped kitchens, are perfect for morning coffee and a bit of breakfast, a quick lunch, or a simple evening meal. Watch TV, read, and take in our gardens to relax after a fun-filled day. Whether you want to sight-see, shop, dine, take in a show, relax, or play, Russian River Studios is your place to stay in the Russian River area.